Expand your feminine wisdom to understand your place in the grand scheme of creation by exploring this new cosmology, presented for the first time from an exclusively woman's point of view in a logical, holistic, and scientifically correct way. 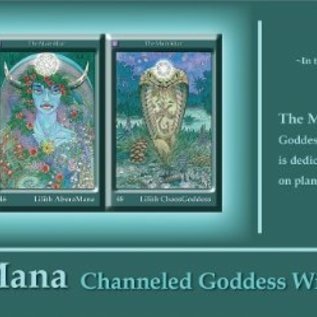 AboraMana, Goddess of Life, Love, and Beauty presents a deck of 89 cards and a handbook that explains the meaning of the cards and the system of the deck. This inspirational work was channeled through the artist by the Living Goddess in a cave on La Palma, Canary Islands, and later on Kapa'a Beach, Kaua'i, Hawaiian Islands. The deck may be used for both readubg and divining. It is a tool of self-discovery intended to help a woman to understand herself and her position in the male-dominated society of today.